Here's the basic recipe. There's really only two key components involved: blending ingredients to best suit your taste AND making sure the yeast is happy. 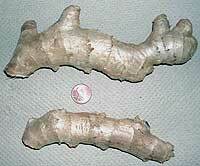 If you can, use a juicer on the ginger root (we use a Champion Juicer). You'll end up with 1/4 to 1/3 cup of juice. Don't drink this stuff straight as it is wicked potent! If you don't have a juicer then slice, dice, or puree as best you can. The goal is to get the juice out or at least make the ginger bits small enough that the juice will come out when boiled. Fill a gallon jug with fresh water, leaving some head room (a cup or so). Like all things the better the water the better the end product, so it's up to you and your taste buds if you use spring water or chlorinated city water. Pour the water from the jug into a big cooking pot and put on the burner to boil. Add the ginger and any spices or fruits/juices. Toss in the sugar and stir well until dissolved. While you wait for the water to boil you should reconstitute the yeast. This means taking a half a cup of warm water (not hot, finger warm). I'll often dissolve a teaspoon of sugar in the water, the yeast is much happier when it wakes up to find something to eat! Sprinkle the yeast over the top. Don't stir, let sit for fifteen minutes. We use bread yeast since it is readily available and is good at putting out lots of CO2 gas. Wine yeasts are engineered to generate less CO2, which means we'd have to ferment longer for the same amount of bubbles and we'd probably have more alcohol in the end product. Since we are interested primarily in bubbles the bread yeast works perfect. Meanwhile let the water boil for a few minutes. If you are using fresh lemons or diced ginger you might want to boil longer to extract more flavors. Once done boiling put the pot in a sink full of cold water. This will help it cool down quickly so you can finish up the first stage, putting ice cubes in the sink will help too. Once the temperature is below a hundred degrees fahrenheit (lukewarm) strain the liquid through a sieve or cheesecloth back into the gallon jug. 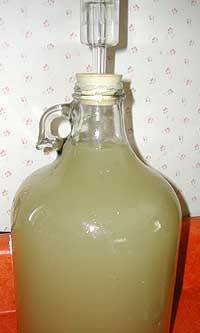 Stir up the reconstituted yeast and add to jug, stir well, and then seal loosely. To seal the jug you can use a brewing airlock, a balloon stretched over the lip (wash balloon out first), or some clean cloth draped over. Mostly you want to keep bugs from getting in while still allowing gas to escape once the yeast kicks in. Place jug in a warm location but not in direct sunlight.